Two years ago MasterCraft Safety turned the seat market on its head with the introduction of the Nomad. This fixed back suspension seat provided MasterCraft’s famous quality materials and workmanship at a price that the competition couldn’t match. 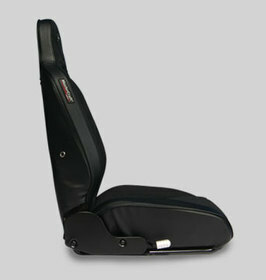 Now we have done it again with the introduction of the Sahara™Reclining Seat. While we are never willing to compromise on safety, we also recognize that different households have varying budgets to devote to their passions and hobbies. It was with this thinking in mind that the Sahara™ was created. The Sahara™ seat offers many of the same features and qualities that made the MasterCraft brand a mainstay amongst off-road and Jeep enthusiasts. The Sahara™ is a true suspension seat designed from the ground-up featuring precision-crafted tubular construction, an open-mesh liner, and high resiliency foam for comfort, longevity and the durability MasterCraft Safety is famous for. So how is MasterCraft Safety able to offer a full featured seat at a price point under $350? 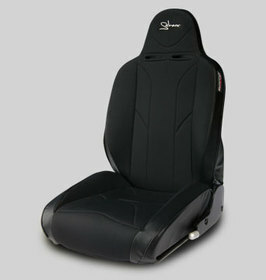 The MasterCraft Safety Sahara™ is a budget-minded import version based on our legendary Baja RS seat. The Sahara™ is only offered in black, with only two part numbers (the only difference is which side the reclining lever is on). The Sahara™ also uses the same mounting tabs and installation kits as the Baja RS, so no additional development costs were required. These savings are passed on to the customer and allow us to utilize high end materials like the wear-resistant proprietary UV treated seat cover fabric while maintaining a reasonable price.